IDEF (Integration Definition for Function Modeling) relates to the family of modeling languages in the field of systems and software engineering. IDEF covers a wide range of uses, from the functional modeling to the object-oriented analysis and design. There are many types of IDEF diagrams and methods, two among them are used as the base for business process models - IDEF0 and IDEF3. 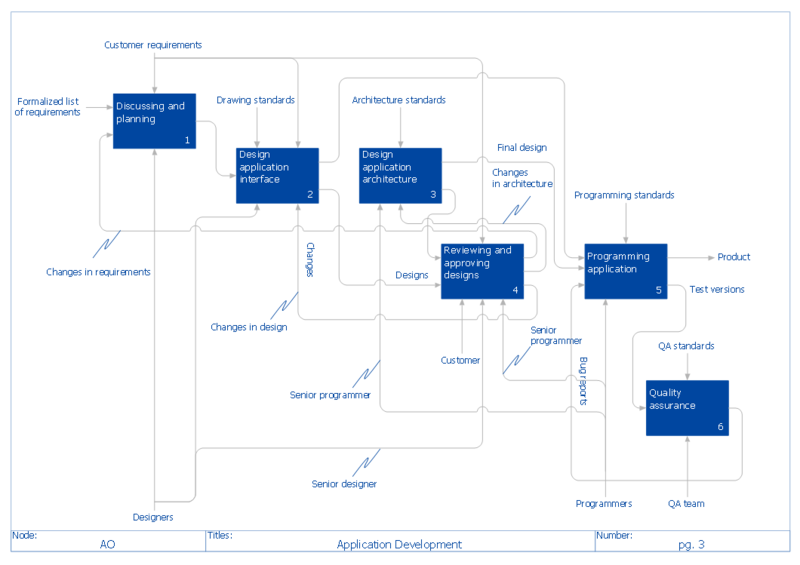 The IDEF0 method is built on the functional modeling language Structured Analysis and Design Technique (SADT) and focuses on activity modeling. The modeling of the entire business and its processes is always difficult process, because even for small-size businesses the business processes are complex. The IDEF0 method facilitates the modeling of the business as a complex system and makes it simple for understanding. The IDEF0 Diagrams are succesfully used for documenting the business, for analysis, development, reengineering, integration of information and software systems. The IDEF0 notation is based on the Air Force Wright Aeronautical Laboratories Integrated Computer-Aided Manufacturing (ICAM) Architecture and was standardized in 1993 by the National Institute of Standards and Technology. 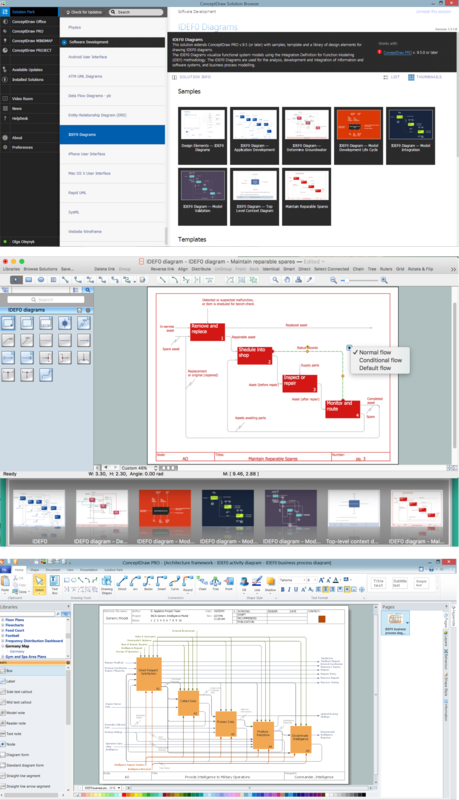 The ability to create the IDEF0 flowcharts and business diagrams rapidly and without efforts is made possible thanks to wide range of intuitive tools of ConceptDraw DIAGRAM software and IDFE0 notation supplied by IDEF0 Diagrams solution from the Software Development area. This solution is rich for the ready-to-use specific IDEF0 flowchart symbols grouped in IDEF0 Diagram library. 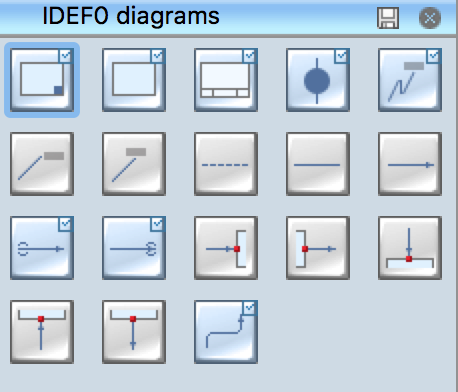 The IDEF0 Diagram library contains 18 IDEF0 flowchart symbols. All they are vector, so you can resize them without loss of quality, change their color to make your flowcharts and diagrams more attractive. 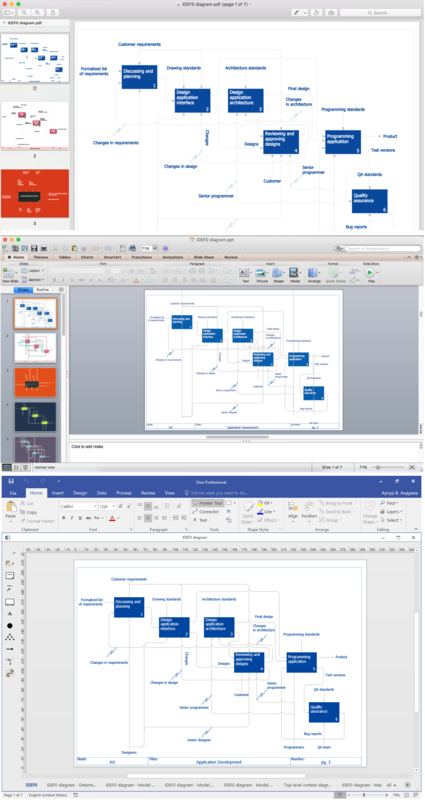 Note that one more set of IDEF0 flowchart symbols is also offered by IDEF0 library from the IDEF Business Process Diagrams solution from the Business Processes area of ConceptDraw Solution Park. You can combine the objects from both these libraries at your diagram, if required. The flowcharts and diagrams are the major components of IDEF0 models and are used to model the decisions, actions, and activities of an organization or other system. An IDEF0 model is made up of several diagrams, each diagram describes in more detail a box from a more general diagram. 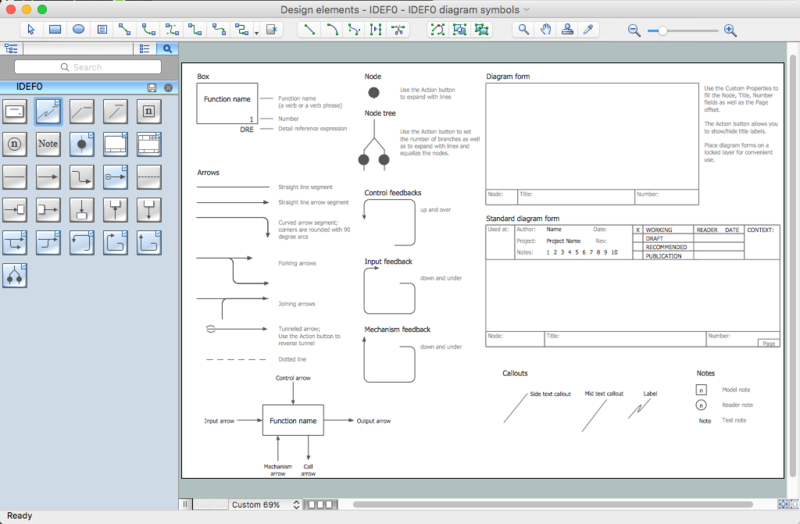 You can start design with Diagram Box element from the IDEF0 Diagram library. 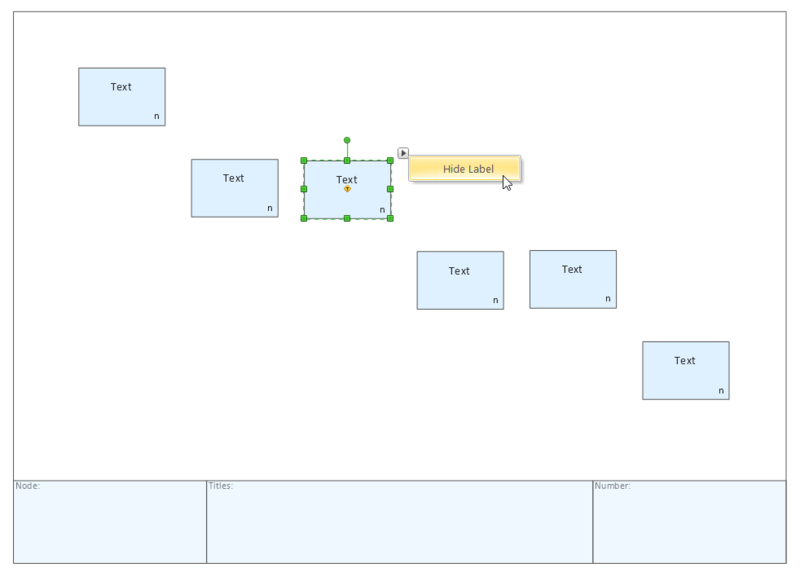 Then add the boxes that represent functions such as activities, actions, processes or operations by dragging them from the library into the Diagram Box. Arrange the boxes and resize the Diagram Box, if needed. To make changes to IDEF0 objects, use the Action button menu at the object's right top corner. 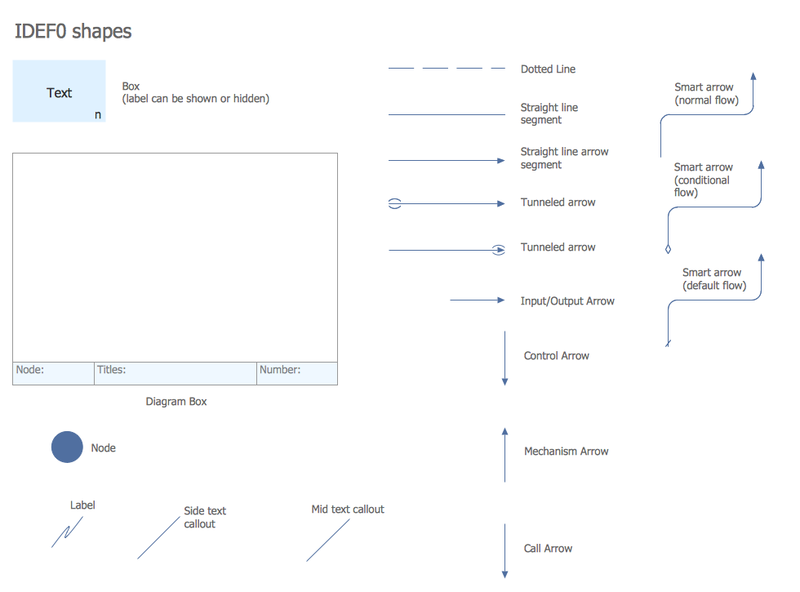 The data and objects which interrelate with the functions are represented by arrows, connect the IDEF0 elements with arrow connectors. Add the text and make color changes. The IDEF0 Diagrams solution offers also large quantity of predesigned templates and samples that are available from ConceptDraw Solution Park. Use any of them to create your own IDEF0 Diagram on its base. The ConceptDraw DIAGRAM software allows you create the IDEF0 digrams and flowcharts of complex processes more easily by providing variety of drawing tools, connector tools, samples, templates and drag-and-drop IDEF0 flowchart symbols contained in IDEF0 Diagrams library from the IDEF0 Diagrams solution of Software Development area and IDEF0 library from the IDEF Business Process Diagrams solution of Business Processes area. 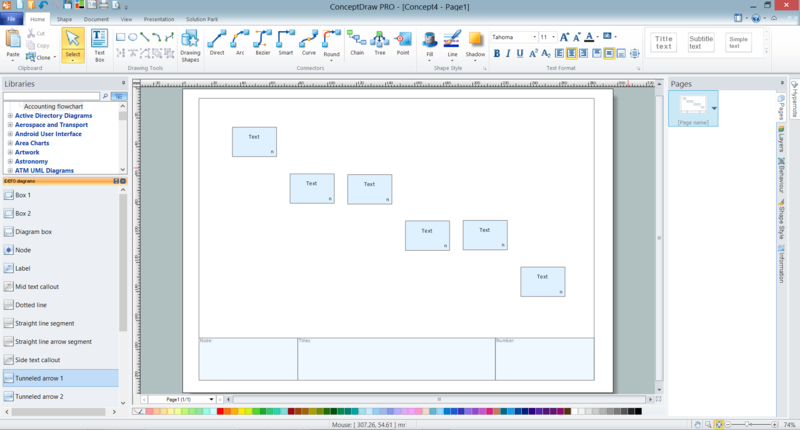 Any IDEF0 Diagram designed in ConceptDraw DIAGRAM software can be then easy printed, exported to various formats, including PPT, PDF, MS Visio, HTML, and many other graphic formats. 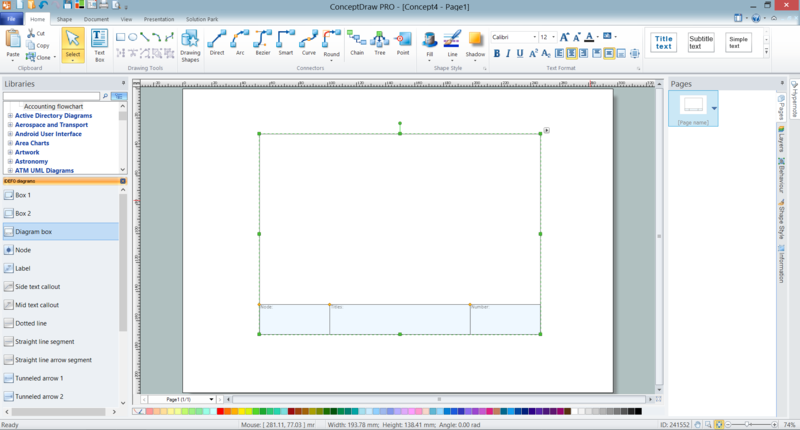 Download ConceptDraw diagram software for easy drawing.